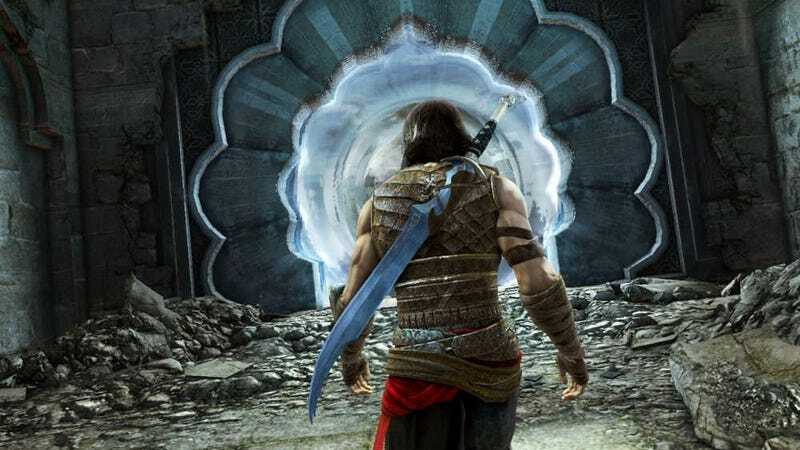 Elemental powers, time manipulation and a story that fills in seven years of the Prince of Persia's past are the hallmarks of the upcoming Prince of Persia game, The Forgotten Sands. "In this installment we are returning to the Sands of Time universe," Michael McIntyre, the game's level design director, told Kotaku during a meeting last week. Specifically, Prince of Persia: The Forgotten Sands will take place during the seven year gap between the end of The Sands of Time and the beginning of the Warrior Within. "We only know he went on other adventures," McIntyre said. "It was always this pocket of time that was interesting to us. Obviously the prince changed a bit from naive to dark and pessimistic" between the two games. The game opens up with the prince visiting his older brother Malik, but when he arrives he finds his brother's city under attack. It turns out, McIntyre says, that Malik cut a deal with an ancient sand army to save his kingdom and now, as sand armies are wont to do, they've run amok turning his citizens into sand. Because the game opens up after Sands of Time, the prince already has the ability to rewind time. As he progresses through the game he befriends a Djinn named Razia who grants him a number of new powers loosely tied to the elements. McIntyre started playing for me to watch at the opening scene, showing the devastation of Malik's kingdom. He points out that the prince is meant to look and handle a lot like the prince of the Sands of Time, a game he later referred to as the high point for the Prince of Persia franchise. "This game is very reminiscent of Sands of Time," he said. "We tried to evoke that look and feel." Combat too will be very familiar to those who have played Sands of Time, with the prince often having to face multiple enemies as they try to surround him. This time though, McIntyre said, the game has you fighting up to 50 people at once. It can do that because it's built using the Anvil Engine, the same game engine used for Assassin's Creed II. "The core of the fighting mechanic,"McIntyre said, "is doing crowd control. You don't block in this game, you evade." As he talks McIntyre runs the prince across a wall, over a gap, and then into a pile of enemies. "The big mechanic here is to do your combos," he said. "But the combos don't drive you in a straight line. It kind of feels like Sands of Time combat, but cranked up to 11." On the screen the prince rolls through people, jumps over them and nearly crowd surfing, running across the foes' heads and shoulders. While the increase in on-screen enemy head count is important, the most notable addition to the franchise are those elemental powers. How those powers interact with one another and the prince's acrobatic skills, allows the developers to create impressive, moving, brain teasers. For instance, holding a trigger allows the prince to solidify water, not freeze it, but slow it down to a point in which it becomes solid. Then the prince can run up or along it, as if it were a wall. Later in the game, McIntyre walks the prince into a room with an assortment of fountains shooting water horizontally and vertically. Holding the trigger turns these fountains into columns that the prince can scale and swing from. There are a total of four core powers to earn, each of which is assigned to a different button or trigger. As you unlock these powers the game's puzzles become more and more complex. For instance, in one area McIntyre had to manage the water power while flipping through a room on columns, sometimes solidifying it, sometimes letting it flow so he could jump through it. After unlocking the core power Dash, which was described as a mix between air and fire, McIntyre had to use both abilities and the prince's acrobatics to get through areas. "It's something you can quickly intuit as a player," he said, "but it opens up a lot of of possibilities." While my demonstration was very puzzle heavy, McIntyre assured me there would be plenty of combat too. "The balance is similar to Sands of Time," he said. "We have exploration that includes trying to solve a room, then there is action, which includes combat and faster acrobatics. It ends up being about 50/50." The game will also have a selection of smaller powers that can be purchased to customize the prince. Those powers include things like a shield that knocks people back or the ability to summon up small tornadoes. The game looks very familiar, and judging but what I saw, it appears the play will be familiar as well. And there were a lot of little things that look like they might add to the experience. For instance, the cities of Prince of Persia have often lacked a populous. That's still true with Forgotten Sands, but this time they've used a plot point, that pesky sand army, to not only explain the populations absence, but include them in some way. Throughout the levels I saw there were sand statues of people posed to help you piece together what had happened before the prince's arrival. These little vignettes add a bit more depth to the games' typically singular stories. "They breathe a lot into the world," McIntyre said. "It has that real Pompei vibe." The Forgotten Sands is due out this May for the PC, Playstation 3 and Xbox 360. A separate version of the game is coming to the Wii with a different storyline and powers.